I have a soft spot for Japan. I also have a soft spot for blinky control panels. So it was with no small amount of joy when, during my last visit to Japan, I found these fake control panel buttons for sale at a toy store in Tokyo. 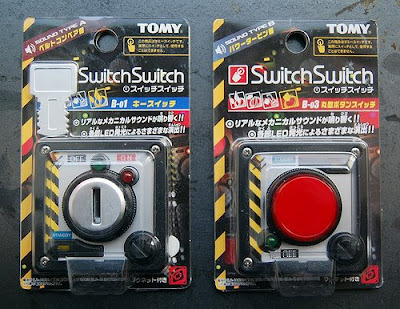 Called "SwitchSwitch" and made by Tomy, they're kind of hilarious and kind of brilliant. When activated, each comes alive with a variety of blinking LED lights and heavy-machinery noises that sound like a General Motors factory circa 1965. Each also has a magnet on the back, for easy attachment to refrigerators, filing cabinets, or vintage automobile dashboards. All that, for just a few hundred yen apiece. What a bargain!